When eating out in Portugal, you will soon notice that the cuisine is still very traditional, even the more modern, chic eateries stay close to their origins, adding an innovative, artistic touch. 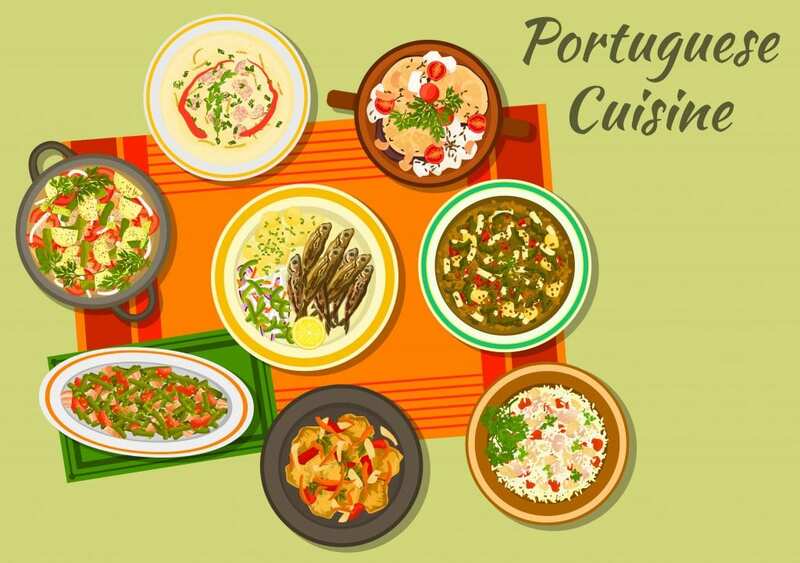 We have put together this useful Portuguese to English glossary and menu decoder to help you get the most out of your Portuguese dining and cuisine experiences. Print it out and use it on your next Tour in Portugal. And of course, please let us know if we should add anything to it. Bom apetite! bem passado/mal passado – well done/rare. pão integral – wholemeal bread. piri piri – hot chilli sauce. prato do dia – dish of the day. adegas – wineries or wine cellars. carioca – weak black coffee. ginjinha – is a liqueur made by infusing ginja berries (sour cherry). vinho da casa – house wine. vinho verde – semi-sparkling, young wine. amêijoas – clams with butter and parsley. arroz de polvo – octopus with rice. atum grelhado – grilled tuna fish. caldeirada de peixe – fish stew. cataplana – fish/shellfish cooked with ham, onion & pepper. rissois de camarao – shrimp pies. sopa de marisco – shellfish soup. sopa de peixe – fish soup. batatas fritas – fried potatoes. sopa de feijao verde – green bean soup. sopa de grao – chickpea soup. sopa de legumes – vegetable soup. alheira – a type of Portuguese sausage, made with meats other than pork (often chicken, duck, rabbit). arroz à moda de valência – paella. arroz de pato – duck with rice. churrasco – pork on a spit. feijoada – dried beans with rice and meat. francesinha – grilled steak, ham, &cheese in a beer and tomato sauce, with a fried egg on top. frango de carril – roast chicken in hot sauce. frango na pucara – chicken cassarole. morcela – black pudding/blood sausage. paio – smoked pork sausage. pasteis de carne – pastries stuffed with meat. arroz doce – sweet rice/rice pudding. papos de anjo – butter cakes with syrup. pasteis de nata – custard tart. pudim flan – cream caramel.